Bath in an irrigation ditch, Deming, New Mexico, 1963. From Acc. no. 14-0616, Genie and Hector Zavaleta papers. 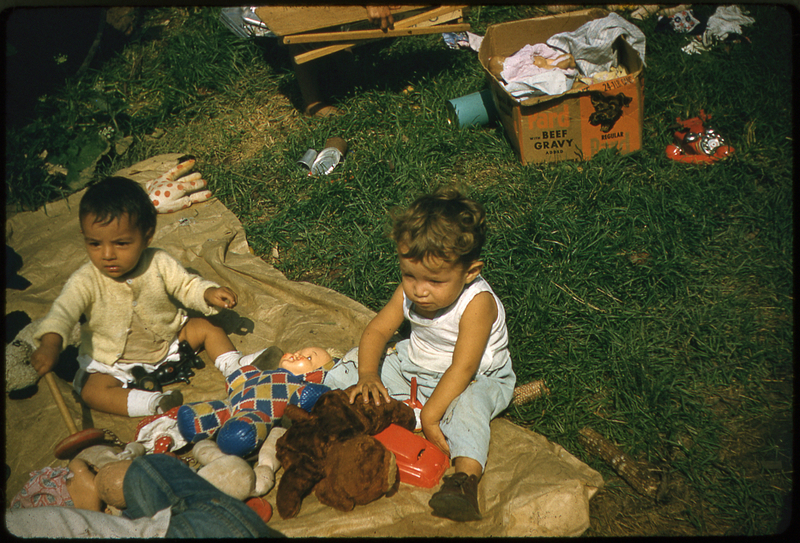 While young Presbyterians of the 1950s and 1960s went to summer camp, Mexican-American children went to migrant laborers' camps in their midst. In spring whole families moved, in trucks with wooden sideboards, tarps covering them and possessions, up from the Rio Grande Valley, to Arkansas to pick cotton, to New Mexico to pick onions, to Indiana to pick cucumbers. Alongside them went Genie and Hector Zavaleta, Presbyterians assigned to the National Council of Churches Migrant Ministry. American farms had long used migrant labor; prior to the Immigration Act of 1924, these were new immigrants from Southern and Eastern Europe. Protestant women's groups began to minister to the needs of migrants in the 1920s, eventually uniting their efforts within the Federal Council of Churches. Beginning in the 1930s, large corporate farms began to employ Mexican citizens for the labor-intensive work which machines couldn't provide--picking cotton, or gently handling tomatoes and cucumbers. These men--the overwhelming preponderance of the workforce was male--worked without the protections of American labor law, which would have set a floor for their wages and a ceiling for their hours. In 1942, facing critical shortages of agricultural workers, President Franklin Roosevelt established a national bracero program to assign some legal protections to guest workers. Extended in 1949 and 1951, the bracero program brought in as many as 400,000 guest workers per year. By the time the Zavaletas joined the Arkansas braceros, there were an additional half-million domestic migrants in the United States, chiefly of Mexican-American or Native American origin. Children traveled with their parents, moving from camp to camp from spring to fall, missing school. 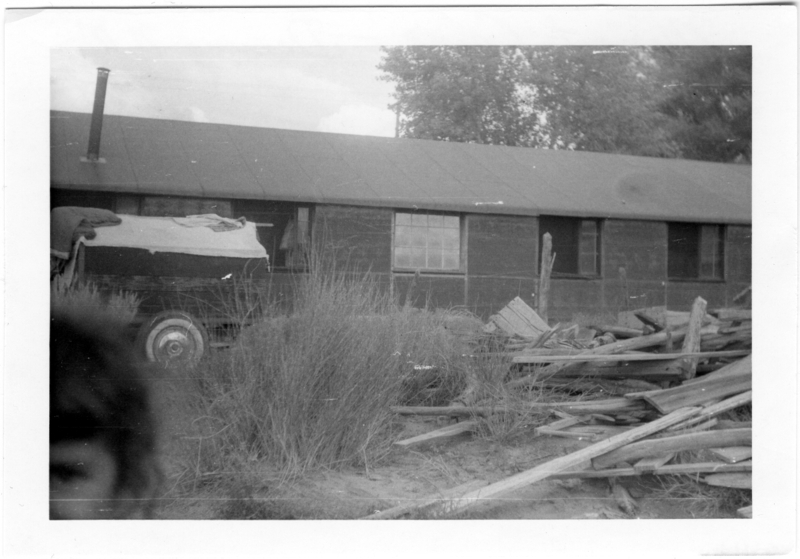 Where employers provided housing for migrant labor, it often amounted to wooden shacks or barns for livestock. With their parents in the field, children looked after one another and played with whatever was at hand--often just crates and barrels. 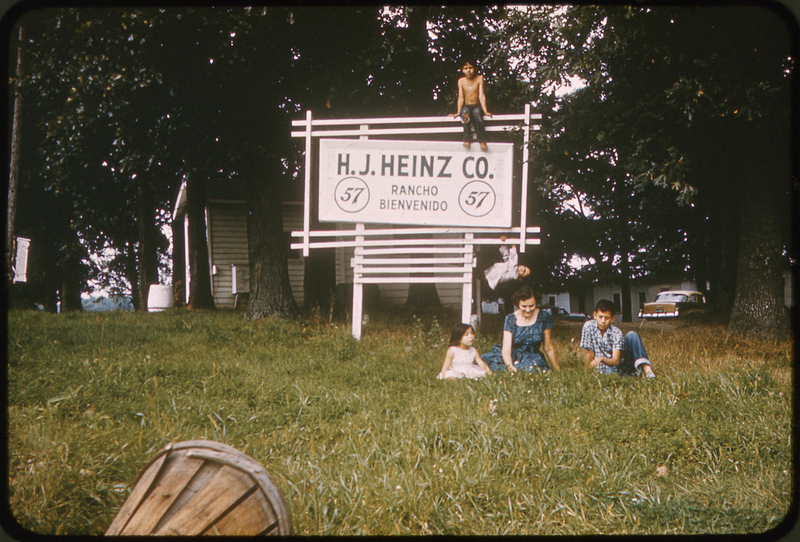 In Plymouth, Indiana in 1958, Genie and Hector and a crew of local women organized a makeshift summer kindergarten for the children of workers picking cucumbers for H. J. Heinz, bringing them games, organizing playgroups, filling in some of the lessons the children would miss during the lost portion of the schoolyear. In 1963 a group of onion harvesters working in Las Cruces, New Mexico, moved sixty miles west to Deming to bring in a tomato crop. Their shelter was a cinderblock out-building open to the air. Their bath was an irrigation canal. Even this limited bivouac was an improvement over the primitive conditions of cotton-pickers' housing in Arkansas which the Zavaletas had seen in the 1950s. For ten summers the Zavaletas traveled with migrant families, administering the smallpox vaccine in Las Cruces, providing milk to children and teenagers bagging onions, making salt dough for toddlers, linking migrant families with local Presbyterian congregations, which provided care packages and invited the children to vacation Bible school. They documented their work extensively, and the first small portion of that documentation has been deposited with the Presbyterian Historical Society. Presbyterians continue to advocate for justice and peace for migrants in America's Southwest, working through the six border presbyteries, through Presbyterian Disaster Assistance, and in partnership with the Iglesia National Presbiteriana de México through the Presbyterian Border Region Outreach. Through the work of the Zavaletas and people like them, continued attention to the spiritual and physical needs of migrants is paid today.